I first tried GlenDronach years ago and my subsequent encounters re-inforced the impression of a rich sherry spice and everything nice range. 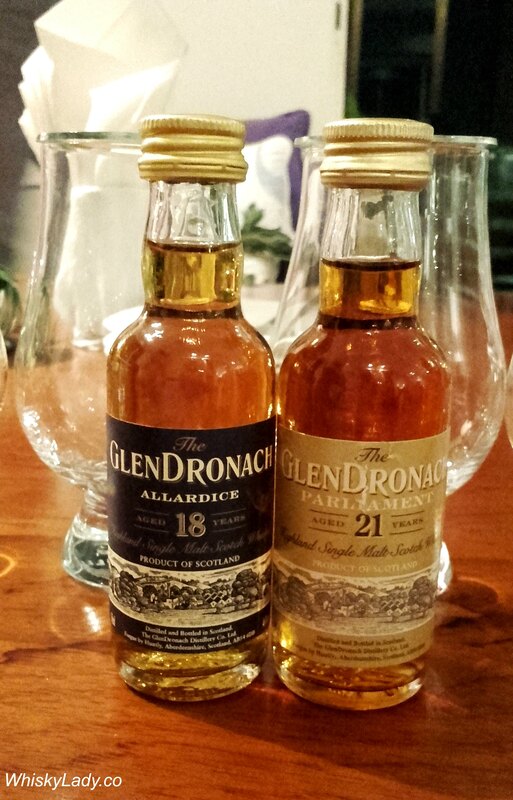 Then along came the exceptional experience of sampling the Glendronach grand dames – 39 / 40 / 41 / 42 years old – extraordinary whiskies well beyond the reach of most malty mortals! For the rest of us though, the core range is in our reach and well worth enjoying. I’ve tried both the 18 & 21 year separately so couldn’t wait to compare them side-by-side! Overall it is an exceedingly drinkable dram. A lovely well balanced tipple to enjoy with others, merrily sipping away while engaging in desultory conversation. Enough going on with the whisky to prompt comments but not distract from a convivial evening either. 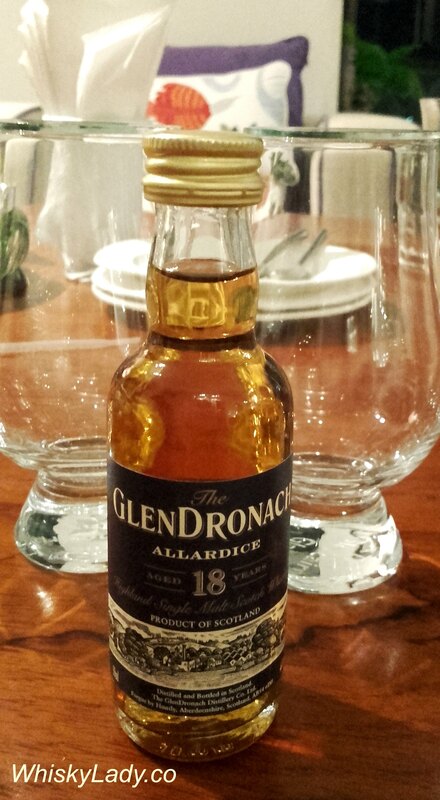 The GlenDronach 18 years old has been named after the renowned founder of the distillery, James Allardice. This exceptional sherried single malt is non chill filtered and of natural colour. Matured in the finest Spanish Oloroso sherry casks and bottled at 46%, this sublime richly sherried malt is truly unforgettable. Nose – Sweet aromatics of fudge and Muscovado sugar. Fruit compote and glacier morello cherries provide added complexity. Palate – Rich dark and seductive. Remarkable flavours of stewed fruits and all-spice marry together with classic aged Oloroso sherry and toasted walnut bread combined with chocolate orange. Conclusion – Tremendously complex and long. One serious dram. No mistaking its sherry character. Commands attention and to be reserved for those times when in the mood for a truly indulgent whisky. 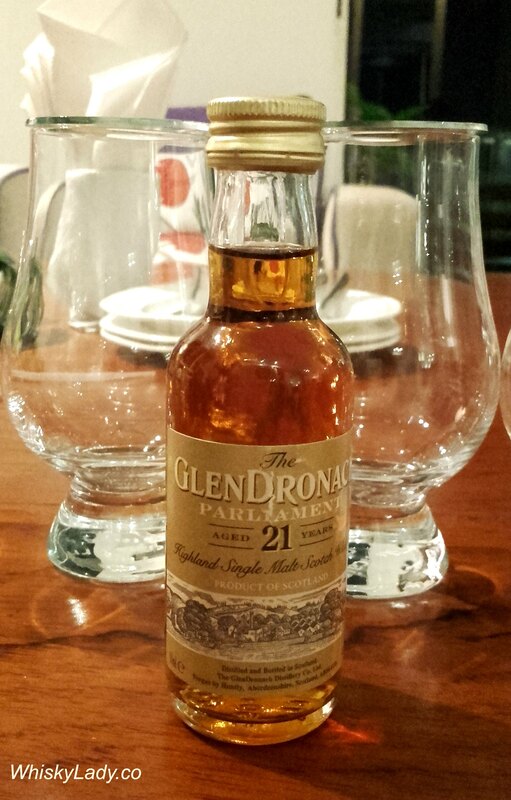 Matured in a combination of the finest Oloroso and Pedro Ximenez sherry casks for a minimum of 21 years, the ‘Parliament’ continues the great GlenDronach tradition of offering fruit-laden intensity in its single malts. This rich expression has been named ‘Parliament’ after the colony, or ‘parliament’, of rooks that have been nesting in the trees that overlook the GlenDronach distillery for almost 200 years. Bottled at 48%, the ‘Parliament’ is non chill filtered and of natural colour. Nose – A delicate mix of ripe autumnal fruits – notably blackberries and red plums. Rich Oloroso sherry and candied orange segments. Spiced oatmeal biscuits and toasted oak fragrances bring excellent weight and balance. Palate – Resolute flavours of fine Oloroso sherry and bitter chocolate sauce, which has been spread liberally over homemade plum pudding. This is all infused with fabulous spicy notes – cinnamon, allspice and nutmeg. Full bodied with smooth tannins. Conclusion – Long and lingering. One small confusion… the bottle we sampled was labeled as 46% and yet from the GlenDronach website, it seems they bottle Parliament at 48%, so there could be some variation. So… how did they compare? Both were superb! Wouldn’t hesitate to reach out to either but would select based on mood, context and company. My companions were of the firm opinion that if buying to share with others, would opt for the more affordable and affable Allardice 18 year. Not that the Parliament 21 year isn’t fantastic, far from it! Just that it is a little heavier on the wallet and equally delivers a rich, heavy dram that need focused attention – not for everyone or every mood – but what a whisky! When I re-read my earlier posts, I had thought Allardice a little pale next to my memory of the Parliament. Side by side it fully holds its own. They are clearly from the same family and I found so much more in the newly opened 18 year! I equally absolutely loved how the 21 year mellowed, softened yet made more intense many of the enjoyable elements found in the 19 year. The complexity of the Parliament stands out, however completely agree with my fellow samplers that if thinking of a dram for others, would introduce GlenDronach with the 18 year (or the 15 year Revival… but that is another matter!). More good news for India – you can buy GlenDronach through The Vault or Delhi duty free! This entry was posted in Highland, Scotland and tagged Allardice 18 year, GlenDronach, Parliament 21 year, Sherry by Carissa Hickling. Bookmark the permalink.